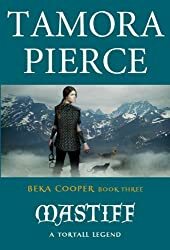 Mastiff is book three of the Legend of Beka Cooper by Tamora Pierce. In Mastiff, we follow Beka a few years after her last adventure. She’s still a Dog, still fighting crime. But now, she’s also fighting her heart. Her betrothed has just died, and she isn’t feeling the grief she thinks she should be feeling. About that time, she is called away in the middle of the night for a Hunt with her partner, Tunstall, and her scent hound, Achoo. Traveling to the Summer Palace, they realize the Prince has been kidnapped, and it’s up to them plus a Dog-Mage, Farmer, to get back the heir to the throne. But the plot is deeper than they realize, and the Hunt longer than they hoped. Joined by Lady Sabine, the four must cross the realm in search of the Prince. And along the way, somehow become a team despite their diverse backgrounds and social classes. Mastiff, more so than even the first two Beka books, really shows an adult Beka learning the hardest lessons in life. Who to trust, and how to open her wounded heart.